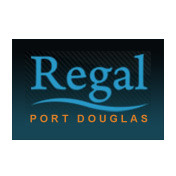 The Regal Port Douglas Accommodation is a 4 star property located right at the start of the restaurant strip in Port Douglas. Offering a variety of 1 and 2 bedroom apartments, all fully-equipped with kitchen & laundry facilities, plus balconies with either outdoor Jacuzzis or indoor spa baths. Your hosts Sheryl & Bob look forward to making your holiday enjoyable and to go home with great memories of Port Douglas and Tropical North Queensland.